My blog post last year about the Inter-American Geodetic Survey (IAGS) has has proven to be my most popular post, both in the number of pageviews and the number of comments. Although I’m not burning up the internet, it is interesting to track where visitor’s interests lie. Surprisingly, my blog post is also the #2 return on Google searches against the term ‘inter american geodetic survey’ (it seems that the acronym IAGS is in use by several completely unrelated organizations that generate a lot of traffic, so searches against that term won’t put my post anywhere near the top of the list). I’m both elated and just a bit saddened by this outcome. Elated that I seem to have hit on poorly covered yet important subject that I can contribute significantly to, yet saddened that the Army Corps of Engineers continues to ignore the very crucial contributions their topographic services and personnel made to the professions of mapping, surveying and geodesy. When I wrote the blog about the IAGS I noted that there’s very little available information about the organization on the web and I tried to provide links to as much relevant info as I could find. 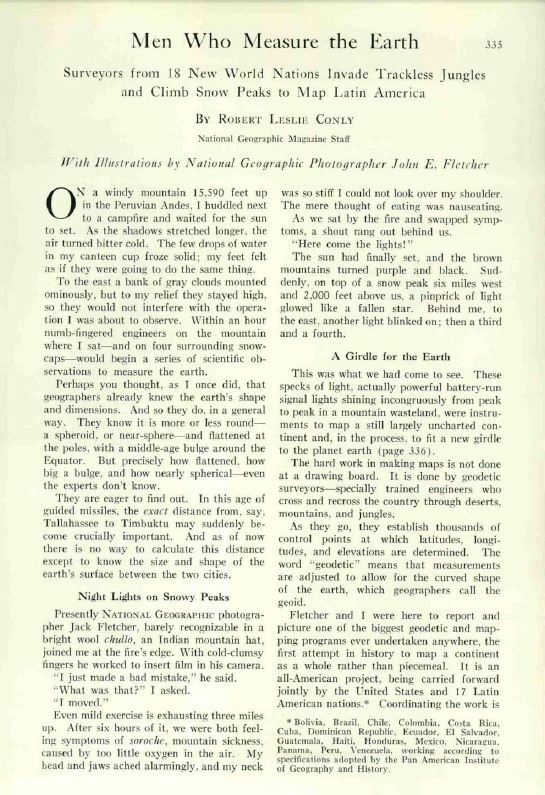 One of the sources I completely ignored was the excellent article about the IAGS that appeared in the March 1956 edition of the National Geographic Magazine. IAGS. Click here to read it. Before the National Geographic gave up serious scholarly writing for feel good stories about baby seals and the therapeutic effects of tree hugging it actually published some darned good stories about geography, exploration, and adventure. All three of these elements come together in this great story about the IAGS. It is probably the best, and perhaps the only, popular account of the agency’s activities. So, follow this link and read about the Men Who Measure the Earth. This entry was posted in History, mapping and tagged iags, national geographic by Brian Haren. Bookmark the permalink. Brian…thank you for your blog on the IAGS. It brought back a number of fond memories. I was a member of the IAGS from 1960 until 1970, and worked in Panama, Colunbia and Paraguay. I consider this time period the “golden years” of the organization. We were welcomed into every part of the countries we worked in. I felt we added a great deal to the mapping success of these area.